These next few days will be critical for your pet. It is important to have realistic expectations; It is imperative you allow a dog time to adjust. Start by dog-proofing the area where your pooch will spend most of his time. Pickup toys and other small loose items; put shoes and clothes out of reach; make sure the trash is in an inaccessible spot; store household chemicals on high shelves; remove plants, rugs, and breakables; tape wires & cords to baseboards; set up a crate, and install baby gates if necessary to block off certain rooms, stairs, door entrances. Do a yard check -- look for loose boards, faulty latches, hidden holes/gaps, and other places a dog may be able to escape. Buy an ID tag with your name, address, and phone number on it. PURCHASE A SLIP LEAD FOR YOUR NEW DOG (excluding young/small puppies). This will be one of the greatest investments you can make at this time; When used properly, a slip lead is a safe secure way to walk your new dog with control, while minimizing the risk of escaping. For the first few weeks, we recommend adult dogs wear a slip lead as well as a leashed harness until they are comfortable in their new home/environment. Slip leads are available at all pet shops; they will cinch if your dog tries to back up out of it suddenly (this can happen in the blink of an eye). Dogs will have no idea where they are or who you are. The first few weeks in a new home is the highest likelihood of flight risk. HFP does not recommend walking your dog on an retractable/extendable leash, ever. Lastly, PUPPIES SHOULD ONLY BE CARRIED IN PUBLIC SPACES UNTIL THEY HAVE COMPLETED THEIR 3 SHOT DHPP SERIES. Start a list of dog supplies you will need: Bed, crate, leashes, harness, collar, food, bowls, safe treats, toys, id tags, etc. Make sure you have done your research on local vets and or trainers. It's very important to trust your vet -- so ask around for referrals if you don’t have one. We also highly recommend & sometimes MAY REQUIRE, first-time owners enroll in dog/puppy-training classes. Even if you have owned dogs in the past, trainers can be useful for helping a new dog adjust to homes with other dogs/animals/cats/children! We work closely with trainers in our area that we are happy to connect you with. The first day and proceeding days can often be the most challenging. Your dog could be very stressed due to the sudden change. Please do not expect too much of your dog too soon. Give him time to acclimate to your home and family before introducing him to strangers and animals outside the home. Lack of appetite/gastrointestinal problems from the stress of transition can be common in dogs during the first week of adoption. Shop around for what food your new dog likes best (As a donation-based rescue, most of our adult dogs are eating Diamond Brand Adult Dry Kibble), but they may enjoy another food better. On the way home: your dog should be safely secured in a crate, via a dog seat belt, tethered to the seat via leash and harness, or held in passenger’s arms. Make sure the dog is double leashed with a slip lead + a harness w/ tags on them before leaving the property (puppies will not need the slip lead, but they will need a collar, tag and way to be carried). Once home, immediately take your new dog to his designated potty area. Spend a good amount of time with him so he will get used to the area and relieve himself (give treat for going potty). Even if your dog does relieve himself during this time, be prepared for accidents. Coming into a new home with new people, new smells and new sounds can throw even the most housebroken dog off-track. Take a nice walk around the block with your new dog to get him familiar with you and the neighborhood. If you plan on crate training your dog, leave the crate open in an accessible area so that he can go in whenever he feels like it in case he gets overwhelmed! The crate is not a tool for punishment, rather a safe space. Make sure it has kongs/treats to occupy the dog. Make sure the children know that the crate is off limits. Please make sure you understand how / how not to properly use a crate before beginning. 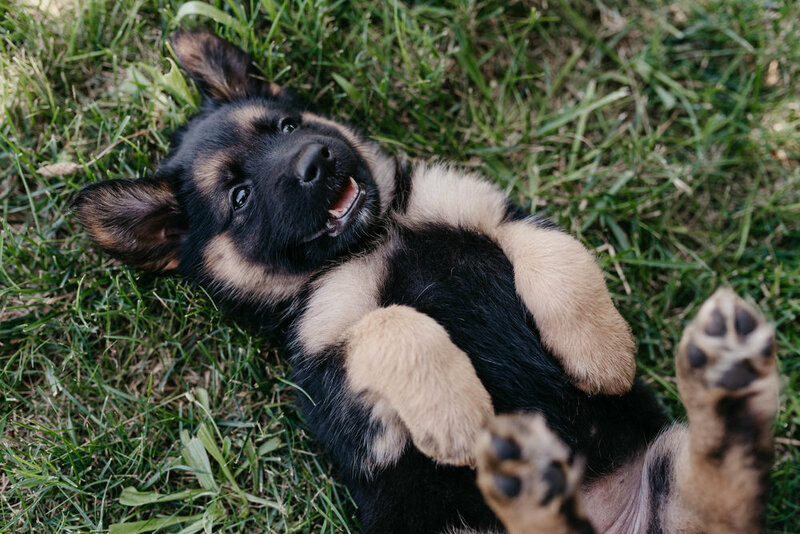 For the first few days or even weeks, remain calm and quiet around your dog, limiting too much excitement (such as the dog park or neighborhood children). Not only will this allow your dog to settle in easier, it will give you more one-on-one time to get to know him and his likes/dislikes. Please keep in mind, your dog may be the product of a never-ending series of scrambled communications and unreal expectations that will require patience on your part. There is no such thing as overnight perfection & THE DOGS NEED TIME TO ADJUST AND IT IS YOUR RESPONSIBILITY TO CREATE A SAFE ENVIRONMENT + ENFORCE RULES and BOUNDARIES . People often say they don’t see their dog’s true personality until several weeks after adoption. Your dog may be a bit uneasy at first as he gets to know you. Be patient and understanding while also keeping to the schedule you intend to maintain for feeding, walks, playtime, etc. This schedule will show your dog what is expected of him as well as what he can expect from you! We highly recommend adopters enroll in dog-training classes so you can learn to read your dog's body language and learn how to better communicate with your dog. Children should never be unaccompanied with a new dog. Be sure to monitor and facilitate all interactions between children/animal. After several weeks you may want to take your dog to the dog park. HFP does not recommend dog parks for safety reasons. However, we understand many dogs thrive with the companionship and company of other dogs. Please consider doing pack walks with family, friends and neighbors early on to allow your dog to safely socialize with canine companions. Individual play dates also provide a safe, more controlled environment for dogs to play! If you still would like to go to a dog park, please stick to ones with fewer dogs or dogs/owners you know. Pay close attention to your dog’s body language & always remain close to monitor interactions. Make sure you and your dog have a good base of basic commands (especially recall & “look”); a good relationship means they are more likely to respond/listen to you in moments that you need them to. Baby steps will lead to success; be patient with the process and you will reap the greatest of rewards — a new family member, and best friend forever!